Skim-coating is the process of applying a thin layer of material, such as cement, over a wall to even out the surface. This process is a good way to prepare a cracked and uneven cement wall for painting or other finishing. The procedure implemented to skim-coat a cement wall is straight forward and easy to follow. Skim-coating a cement wall takes some effort but the skill needed can be attained in a just a few minutes of doing it. 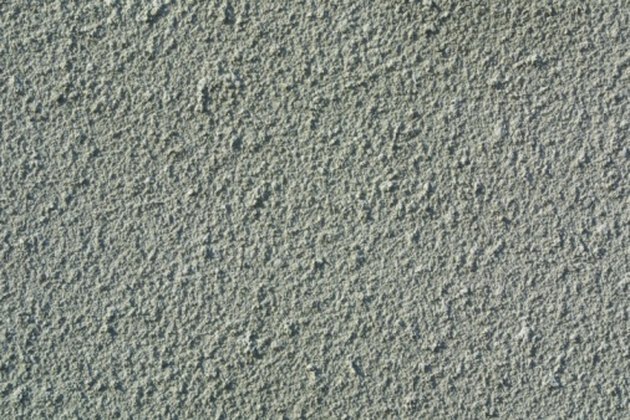 A cement wall can be evened out with the process of skim-coating. Lay plastic drop cloths on the floor to protect it from the skim-coating process. Cover any items such as furniture that will remain in the room during the skim-coating. Scrape the wall lightly with a 6-inch drywall knife to remove any loose cement or other substances stuck on the wall. Fill a 5-gallon bucket halfway with water and add skim-coat cement mix. Mix the cement with the water using an electric drill with a stirring bit installed. Continue to mix and add the powder until it is the consistency of thick wallpaper paste. Start at one end of the wall at the top and work your way down and across the wall's surface. Dip the cement trowel into the bucket of cement and fill the trowel halfway with cement. Spread the cement onto the wall, using the flat side of the trowel to smooth the cement. Remove excess cement using the edge of the trowel in a scraping motion. Apply a thick enough coat to cover the surface with an even coat of cement. Allow the skim-coat to dry for 24 hours before painting. Damon Koch has years of writing experience ranging from software manuals to song lyrics. His writing has appeared in software manuals for Human Arc and on the CDs "Small Craft Advisory" and "Impersonating Jesus." He also has worked in building maintenance since 2004. He has attended Lorain County Community College as well as Cleveland State University.